Comment: Complete in original case! Ships direct from Amazon! 5.0 out of 5 starsI waited for a good price. This movie continues a world changing series of films that literally helped usher in updated 'space adventure' movies. Really well written and paced. Seems to fix in the timeline accurately and has all the elements you seek from a Star Wars movie. Wonderful vistas, intense and exciting when it should be and fun for anyone over 10 years old. Like all used items, I wait for a while to see the price averages and when I see a good deal I jump on it. 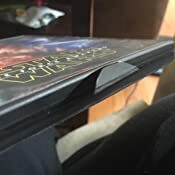 Once you have it, and if you're a sci-fi fan, it'll be on your shelf forever and will be viewed over and over with something new that you missed each time. Buy w confidence. Star wars was a film series that defined my youth. I have owned all of them at some point or another in a variety of formats and have all but memorized them from watching them over and over. I also have been on love with 3d since my youth. 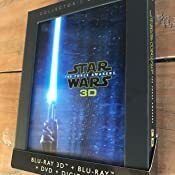 I bought a 3d tv and blu ray years ago, but the Star Wars series was not done in 3d...until The Force Awakens. No matter how many times I'd seen the movie, adding the full, Rich 3d made it come alive. The sound is rich and vibrant with the epic John Williams sound track. The behind the scenes features are informative and entertaining for those who love to know how it's done and what all goes into the production of the film. Even the case is a work of art. 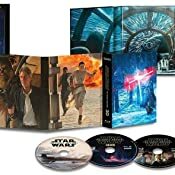 From its attractive, 3d artwork on the cover to the beautifully collectors item inserts, this set seems like it should be far more expensive than it actually is. Whether you loved the film or are a critic, the power of the production on this product is admirable. Well done, folks. Well done. This is the best overall film of the New Trilogy thusfar. The Last Jedi is hyper controversial and philosophical [and I actually love it because It explores a tough subject matter, disillusionment among Jedi and Sith and rebirth of faith in the Force]. The Force Awakens captures a glint of the glory, awe, and wonder of A New Hope and Empire Strikes Back. The Force Awakens is superior to the Prequels/Anakin Skywalker Arch because it invests in the characters ans builds on tjeir realtionahips realistically, similar to A New Hope: common objective, common enemy, team work anx etc oppose to the Prequels more complex political alliances, and emphasis on Zoroastrian and Dualist ideologies. The Force Awakens is pure fun, with enough lore and wonder to keep it from being campy or a total knock off. In particular I applaud J.J. Abrams for his handling of Kylo Ren as a villain. He isn’t a Vader clone or Darth Maul cult creating character, he is the antithisis, unsurd of himself and conflicted, his insecurity and tryingvto overshadow it with Dark Side prowess makes him actuslly more relatable than the dogmaticism of Darth Vader. Kylo Ren is a Sith for a new generatiok, that no doubt may carry the same conflict inside. Rey who has been labeled a Mary Sue, is acruslly refreshing. Men have had plenty of Jedi and Force affilates to choose from: Luke Skywalker, Anakin Skywalker, Obi-Wan Kenobi, Yoda, and maby more; girls and women have only ad Aayla Secura and Ahsoka Tano for female Jedi and they are aliens not humans like Rey. [Legends fans have had Bastila Shan and Mara Jade Skywalker for major human female Jedi]. Finn and Poe both are welcome heroes, one a former stormtrooper and the other a resistance pilot. Their dialogue during their escape from The First Order at the beginning of the Force Awakens always gives me a good chuckle. 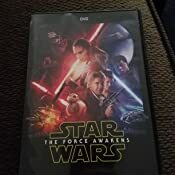 I want to seal this review by stating I am a Legends/EU die hard who knows Dash Rendar, Exar-Kun, Ulic-Quodroma, Mara Jade, Revan, Darth Plagueis, Prince Xinor, the Jed’Daii (proto-Jedi tribes), Ashla and Bogan (Light and Dark Side), Force Grip is a grey power (light or dark depending on who you are using it on), and so much more. I have been following the Legends, called Expanded Universe when I was young, and I enjot the Force Awakens. This not a review of the film, but a review of the media enclosed. Excellent job with this package. One purchase and I can play on any device new or old. DVD + BluRay is a good start. But now Disney allows you to own a copy of their films on every digital service you have. Amazon Video, iTunes, VUDU, etc. This is great. Because I am not a fan of playing the game of which service is going to survive. So this creates a feeling of cloud security which I am happy about. I am also pleasantly surprised that the Extras normally found on the disc alone are present in most of the streaming services that offer this film. I hope more production companies start doing this with their films. No, I'm not spoiling it for anyone, but it is what it is... a continuation of a story. And there are things very different. And there are parts that are just so-so. It wasn't like the first time seeing "Star Wars" because I already knew the universe it took place in, but it does take place in that universe, and is worth the watch. In fact... it's a lot better to buy it here than to have paid for the theater tickets... you get unlimited viewings, can pause for bathroom breaks, bring any food you like, even use your phone during it... and it's probably cheaper than it was for you and one friend to view it once in the theater. 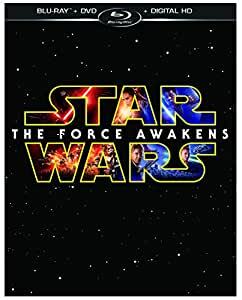 But pricing aside, please watch it with both an open mind, and the thought ... "This isn't Kansas...."
5.0 out of 5 starsYea for a strong female lead in a Star Wars movie!!! It's Star Wars. What else do I really need to say? Having a strong female lead was an absolute joy to watch considering the original and prequel series rather lacked in that department. I did think Kylo Ren was more of an annoyance to the galaxy rather than a true bad guy. He is definitely no Darth Vader or Emperor Palpatine. Maybe he will be better defined as a character in the next movie. The movie leaves you with many more questions than answers, but they do have two more movies in the trilogy to make up for that. While the story line is very similar to that found in A New Hope, it is still a fun romp through space and I look forward to seeing the others as they come out too.